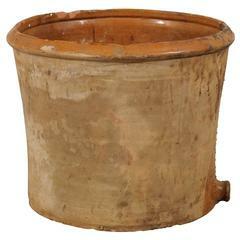 A vintage French large-sized copper kitchen pot. 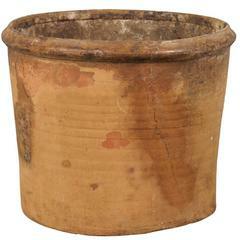 This mid-20th century French farmer's kitchen pot is nicely sized at 2 ft wide. The pot has two side handles and a spout (allows for easier drainage of liquids) which is located at the bottom exterior. The copper has a beautifully aged patina, show of age, and history of use. This midcentury French pot, with its nice girth and height, would make a wonderful planter, a decorative item for a kitchen, or perhaps a nice place to keep cut wood by the fire. Nice wear throughout consistent with age and use. Please refer to the various additional photos for further condition detail. French polished brass large planter with lion ring head handles, 19th century.